The Buddhist crisis (Vietnamese: Biến cố Phật giáo) was a period of political and religious tension in South Vietnam between May and November 1963, characterized by a series of repressive acts by the South Vietnamese government and a campaign of civil resistance, led mainly by Buddhist monks. The crisis was precipitated by the shootings of nine unarmed civilians on May 8 in the central city of Huế who were protesting a ban of the Buddhist flag. The crisis ended with a coup in November 1963 by the Army of the Republic of Vietnam, and the arrest and assassination of President Ngô Đình Diệm on November 2, 1963. In South Vietnam, a country where the Buddhist majority was estimated to comprise between 70 and 90 percent of the population in 1963, President Ngô Đình Diệm's pro-Catholic policies antagonized many Buddhists. A member of the Catholic minority, his government was biased towards Catholics in public service and military promotions, as well as in the allocation of land, business favors and tax concessions. Diem once told a high-ranking officer, forgetting that he was a Buddhist, "Put your Catholic officers in sensitive places. They can be trusted." Many officers in the Army of the Republic of Vietnam (ARVN) converted to Catholicism in the belief that their career prospects depended on it, and many were refused promotion if they did not do so. Additionally, the distribution of firearms to village self-defense militias intended to repel Viet Cong guerrillas was done so that weapons were only given to Catholics. Some Catholic priests ran private armies, and in some areas forced conversions, looting, shelling and demolition of pagodas occurred. Some Buddhist villages converted en masse to receive aid or avoid being forcibly resettled by Diem's regime. The Catholic Church was the largest landowner in the country, and the "private" status that was imposed on Buddhism by the French, which required official permission to conduct public activities, was not repealed by Diem. The land owned by the church was exempt from land reform, and Catholics were also de facto exempt from the corvée labor that the government obliged all other citizens to perform; public spending was disproportionately distributed to Catholic majority villages. Under Diệm, the Catholic Church enjoyed special exemptions in property acquisition, and in 1959, he dedicated the country to the Virgin Mary. The Vatican flag was regularly flown at major public events in South Vietnam. Earlier in January 1956, Diệm enacted Order 46 which permitted "Individuals considered dangerous to the national defense and common security may be confined by executive order, to a concentration camp." This order was used against dissenting Buddhists. A rarely enforced 1958 law—known as Decree Number 10—was invoked in May 1963 to prohibit the display of religious flags. This disallowed the flying of the Buddhist flag on Vesak, the birthday of Gautama Buddha. The application of the law caused indignation among Buddhists on the eve of the most important religious festival of the year, as a week earlier Catholics had been encouraged to display Vatican flags at a government-sponsored celebration for Diem's brother, Archbishop Ngô Đình Thục, the most senior Catholic cleric in the country. However, Diệm proclaimed the flag embargo because he was annoyed with the commemoration for Thục. On May 8, in Huế, a crowd of Buddhists protested against the ban on the Buddhist flag. The police and army broke up the demonstration by firing guns at and throwing grenades into the gathering, leaving nine dead. On May 30, more than 500 monks demonstrated in front of the National Assembly in Saigon. The Buddhists had evaded a ban on public assembly by hiring four buses and filling up and pulling the blinds down. They drove around the city before the convoy stopped at the designated time and the monks disembarked. This was the first time that an open protest had been held in Saigon against Diệm in his eight years of rule. They unfurled banners and sat down for four hours before disbanding and returning to the pagodas to begin a nationwide 48-hour hunger strike organized by the Buddhist patriarch Thich Tinh Khiet. On June 1, Diệm's authorities announced the dismissal of the three major officials involved in the Huế incident: the province chief and his deputy, and the government delegate for the Central Region of Vietnam. The stated reason was that they had failed to maintain order. By this time, the situation appeared to be beyond reconciliation. On June 3, Vietnamese police and troops of the Army of the Republic of Vietnam poured chemicals on the heads of praying Buddhist protestors in the South Vietnamese city of Huế. 67 people were hospitalized and the United States privately threatened to withdraw aid. 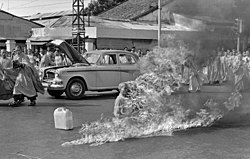 On June 11, Buddhist monk Thích Quảng Đức burned himself to death at a busy Saigon road intersection in protest against Diệm's policies. On July 7, 1963, the secret police of Ngô Đình Nhu—the brother of President Ngô Đình Diệm—attacked a group of journalists from the United States who were covering Buddhist protests on the ninth anniversary of Diem's rise to power. Peter Arnett of the Associated Press (AP) was punched in the nose, but the quarrel quickly ended after David Halberstam of The New York Times, being much taller than Nhu's men, counterattacked and caused the secret police to retreat. Arnett and his colleague, the Pulitzer Prize-winning journalist and photographer Malcolm Browne, were later accosted by police at their office and taken away for questioning on suspicion of attacking police officers. On Sunday, August 18, the Buddhists staged a mass protest at Xá Lợi Pagoda, Saigon's largest, attracting around 15,000 people, undeterred by rain. The attendance was approximately three times higher than that at the previous Sunday's rally. The event lasted for several hours, as speeches by the monks interspersed religious ceremonies. A Vietnamese journalist said that it was the only emotional public gathering in South Vietnam since Diem's rise to power almost a decade earlier. David Halberstam of The New York Times speculated that by not exploiting the large crowd by staging a protest march towards Gia Long Palace or other government buildings, the Buddhists were saving their biggest demonstration for the scheduled arrival of new US ambassador Henry Cabot Lodge Jr., in the following week. As a government attack on Xa Loi was anticipated, Halberstam concluded that the Buddhists were playing "a fast and dangerous game". He wrote that "the Buddhists themselves appeared to be at least as much aware of all the developments, and their protest seemed to have a mounting intensity". On the evening of August 18, ten senior generals of the Army of the Republic of Vietnam met to discuss the situation and decided that martial law would need to be imposed. On August 20, Nhu summoned seven of the generals to Gia Long Palace for consultation. They presented their request to impose martial law and discussed dispersion of the monks. Nhu sent the generals to see Diệm. The president listened to the group of seven, led by General Trần Văn Đôn. Đôn claimed that Communists had infiltrated the monks at Xá Lợi Pagoda and warned that ARVN morale was deteriorating because of the civil unrest. He claimed that it was possible that the Buddhists could assemble a crowd to march on Gia Long Palace. Hearing this, Diệm agreed to declare martial law effective on the next day, without consulting his cabinet. Troops were ordered into Saigon to occupy strategic points. Đôn was appointed as the acting Chief of the Armed Forces in the place of General Lê Văn Tỵ, who was abroad having medical treatment. Don noted that Diệm was apparently concerned with the welfare of the monks, telling the generals that he did not want any of them hurt. The martial law orders were authorized with the signature of Đôn, who had no idea that military action was to occur in the early hours of August 21 without his knowledge. Shortly after midnight on August 21, on the instructions of Nhu, troops of the Army of the Republic of Vietnam Special Forces under Colonel Lê Quang Tung executed a series of synchronized attacks on the Buddhist pagodas in South Vietnam. Over 1400 Buddhists were arrested. The number killed or "disappeared" is estimated to be in the hundreds. The most prominent of the pagodas raided was that of Xá Lợi, which had become the rallying point for Buddhists from the countryside. The troops vandalized the main altar and managed to confiscate the intact charred heart of Thích Quảng Đức, the monk who had self-immolated in protest against the policies of the regime. The Buddhists managed to escape with a receptacle holding the remainder of his ashes. Two monks jumped the back wall of the pagoda into the grounds of the adjoining US Aid Mission, where they were given asylum. Thich Tinh Khiet, the 80-year-old Buddhist patriarch, was seized and taken to a military hospital on the outskirts of Saigon. The commander of the III Corps of the ARVN, Tôn Thất Đính soon announced military control over Saigon, canceling all commercial flights into the city and instituting press censorship. Once the US government realized the truth about who was behind the raids, they reacted with disapproval towards the Diệm regime. The Americans had pursued a policy of quietly and privately advising the Ngos to reconcile with the Buddhists while publicly supporting the alliance, but following the attacks, this route was regarded as untenable. Furthermore, the attacks were carried out by American-trained Special Forces personnel funded by the CIA, and presented incoming Ambassador Henry Cabot Lodge Jr., with a fait accompli. The State Department issued a statement declaring that the raids were a "direct violation" of the promise to pursue "a policy of reconciliation". On August 24, the Kennedy administration sent Cable 243 to Lodge at the embassy in Saigon, marking a change in American policy. The message advised Lodge to seek the removal of Nhu from power, and to look for alternative leadership options if Diem refused to heed American pressure for reform. As the probability of Diệm's sidelining Nhu and his wife was seen as virtually nil, the message effectively meant the fomenting of a coup. The Voice of America also broadcast a statement blaming Nhu for the raids and absolving the army of responsibility. After the events of August, Diệm's regime became a major preoccupation for the Kennedy administration and a fact-finding mission was launched. The stated purpose of the expedition was to investigate the progress of the war by South Vietnam and their American military advisers against the Viet Cong insurgency. The mission was led by Victor Krulak and Joseph Mendenhall. Krulak was a Major General in the United States Marine Corps, while Mendenhall was a senior Foreign Service Officer experienced in dealing with Vietnamese affairs. The trip lasted four days. In their submissions to the NSC, Krulak presented an extremely optimistic report on the progress of the war, while Mendenhall presented a very bleak picture of military failure and public discontent. Krulak disregarded the effects of popular discontent in combating the Viet Cong. The general felt that the Vietnamese soldiers' efforts in the field would not be affected by the public's unease with Diệm's policies. Mendenhall focused on gauging the sentiment of urban-based Vietnamese and concluded that Diệm's policies increased the possibility of religious civil war. Mendenhall said that Diệm's policies were causing the South Vietnamese to believe that life under the Viet Cong would improve the quality of their lives. The divergent reports led US President John F. Kennedy to famously ask his two advisers, "The two of you did visit the same country, didn't you?" The inconclusive report was the subject of bitter and personal debate among Kennedy's senior advisers. Various courses of action towards Vietnam were discussed, such as fostering a regime change or taking a series of selective measures designed to cripple the influence of the Nhus, who were seen as the major causes of the political problems in South Vietnam. The inconclusive result of Krulak and Mendenhall's expedition resulted in a follow-up mission. On November 1, 1963, after six months of tension and growing opposition to the regime, generals from the Army of the Republic of Vietnam conducted a coup, which led to the fall of the Diem government and the arrest and assassination of the president. ^ Adam Roberts, 'Buddhism and Politics in South Vietnam', The World Today, Royal Institute of International Affairs, London, vol. 21, no. 6, June 1965, pp. 240–50 analyses the causes of the Buddhist crisis and its significance as a case of non-violent struggle. ^ "The Religious Crisis". Time. June 20, 1963. Retrieved August 21, 2007. ^ "The Situation In South Vietnam – SNIE 53-2-63". The Pentagon Papers (Gravel ed.). July 10, 1963. pp. 729–733. Retrieved August 21, 2007. ^ a b Gettleman, pp. 280–282. ^ "South Vietnam: Whose funeral pyre?". The New Republic. June 29, 1963. p. 9. ^ "Diệm's other crusade". The New Republic. June 22, 1963. pp. 5–6. ^ a b Manhattan, Avro (1987). Vietnam: Why Did We Go?. Chick Publications. pp. 78–79. ^ Hammer, pp. 118, 259. ^ a b c Halberstam, p. 140. ^ a b Sheehan, p. 354. ^ a b Hammer, p. 168. ^ a b c Jones, pp. 356–360. Buttinger, Joseph (1967). Vietnam: A Dragon Embattled. New York City: Praeger. Fall, Bernard B. (1963). The Two Viet-Nams. London: Praeger. Gettleman, Marvin E. (1966). Vietnam: History, documents and opinions on a major world crisis. Harmondsworth, Middlesex: Penguin Books. Halberstam, David; Singal, Daniel J. (2008). The Making of a Quagmire: America and Vietnam during the Kennedy Era. Lanham, Maryland: Rowman & Littlefield. ISBN 0-7425-6007-4. Karnow, Stanley (1997). Vietnam: A history. New York City: Penguin Books. ISBN 0-670-84218-4. Langguth, A. J. (2000). Our Vietnam: the war, 1954–1975. New York City: Simon and Schuster. ISBN 0-684-81202-9. Maclear, Michael (1981). Vietnam:The Ten Thousand Day War. New York City: Methuen Publishing. ISBN 0-423-00580-4. Miller, Edward (2013). Misalliance: Ngo Dinh Diem, the United States, and the Fate of South Vietnam. Boston: Harvard University Press. ISBN 978-0-674-07298-5. Prochnau, William (1995). Once Upon a Distant War. New York City: Times Books. ISBN 0-8129-2633-1. Tucker, Spencer C. (2000). Encyclopedia of the Vietnam War: A Political, Social and Military History. Santa Barbara, California: ABC-CLIO. ISBN 1-57607-040-9. Warner, Denis (1963). The Last Confucian. New York City: Macmillan.